Frustrated people post in their social network page that every month there are 10 to 20 blackouts in their area of residence and this has been happening for many, many years already. With several power plants due for operations in a couple of years' time, it should take the Federal Government less than 10 years to fully address this issue, no matter how complicated the situation at SESB is. 10 years is way too long, but 'some plan' is better than nothing! Newspaper clipping - DE, 17-7-2013. What we hear more often is that IPPs in the West Coast are having hard time maintaining their equipment, and Power Plants in the East Coast are delaying the full commissioning/operations of their long-delayed-temporarily-installed generators. So, the assurance that "any financial requirement would be approved, if justified" is much welcomed! Come on, you guys! 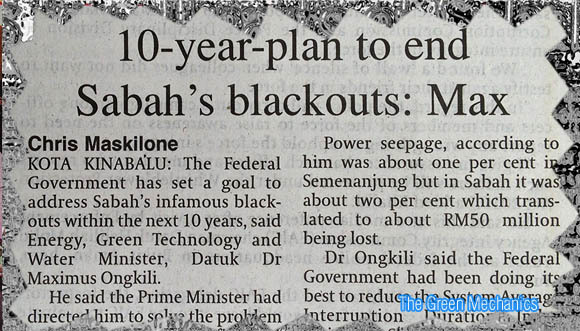 Kota Kinabalu: The Federal Government has set a goal to address Sabah's infamous blackouts within the next 10 years, said Energy, Green Technology and Water Minister, Datuk Dr Maximus Ongkili. He said the Prime Minister had directed him to solve the problem in Sabah and that any financial requirement would be approved, if justified. The tariff collection by Sabah Electricity Sdn Bhd (SESB) was only sufficient to cover 80 per cent of its operational cost and the rest was being subsidised by Tenaga Nasional Berhad (TNB), he said. "But for how long can this go on?" he said at the breaking of fast with the media and orphans in Promenade Hotel here Tuesday. Power seepage, according to him was about one per cent in Semenanjung but in Sabah it was about two per cent which translated to about RM50 million being lost. Dr Ongkili said the Federal Government had been doing its best to reduce the System Average Interruption Duration Index (SAIDI) in Sabah and had spent about half a billion ringgit in the past three years for the purpose. In Sabah's case, he said the issue of power generation, transmission and distribution must be addressed in order to reduce Saidi. For power generation, he said the Federal Government had to re-strategise its planning when the proposed coal-fired power plant project in Lahad Datu was scrapped after seven years of debate. Among the issues that needed to be addressed to improve distribution of power was the fact that about 80 per cent of Sabah's cables being open cables are not coated, meaning it might take just one curious bird landing on the power cable to cause a major power disruption. a case of caring too much for the environment when still having constant blackouts or rather load shedding,if Lahat Datu coal plant have been up a lot might have changed. There is also a need for a fuel mix as right now only diesei is available on the east coast,even if the LNG regasification plant is up,tariff will have to rise as LNG is purposely imported as to justify price increase..
Agree on the 'caring too much for the environment" comment. While I support the call to preserve nature, I believe we can take certain level of risk so long as we manage it well. Afterall we take risk everyday in our life. In industry (and all engineering procurements) it's the lack of preventive measures and maintenance that lead to environmental problems.